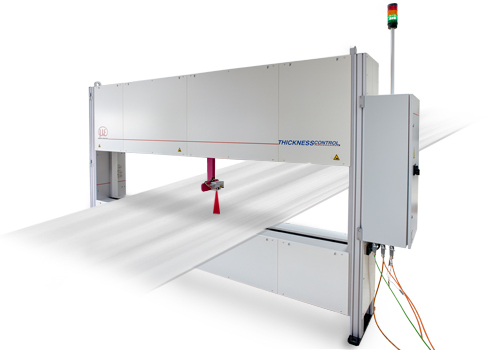 In strip systems such as longitudinal and cut-to-length slitting shears, the advantages of C-frame and O-frame shaped thicknessCONTROL 820x und 920x measurement systems become particularly clear. 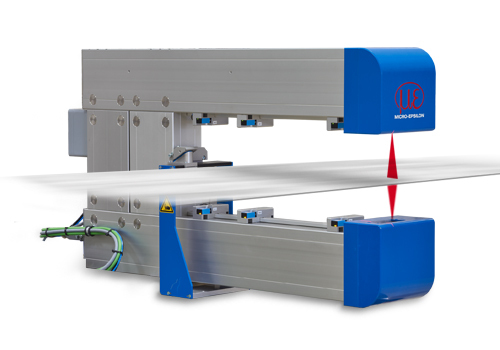 The high lateral resolution of discrete laser lines enables both thickness measurements and width detection. Also in grinding and milling lines, these systems offer high precision measurements on highly polished surfaces. The O-frame is integrated in longitudinal slitting shears before the slitting unit. The system measures the cross-section over the total width, recognizing the edge position and adapting the traversing position according to movements of the floating strip and changing widths. The C-frame is behind the grinding unit. The system measures the center thickness over the total length of the product. An interface transmits the measurement data to the grinding machine in order to control material removal. The system detects cross-section, thickness profile and longitudinal profile of each individual ring.